Friday, Evan and I went to support our friend Aaron in a play. We didn’t know what to expect — the last time I went to support a friend of a friend in a play, he only showed up in the last scene and played a mute. Seriously. In any case, our experience Friday couldn’t have been more different. We showed up at the Tre Stage, upstairs in a strip mall at La Brea and Sunset, and were greeted at the door by a nice little crowd of theater-goers. We paid our $15 and were immediately offered a glass of wine at no charge. We soon got to go into the theater itself, a small room, painted black, with two rows of bench seats in an ‘L’ around the stage. After passing the wine bottles around again for pre-show refills, the lights dimmed in the intimate black box theater, and the show started with a short slide show and music. 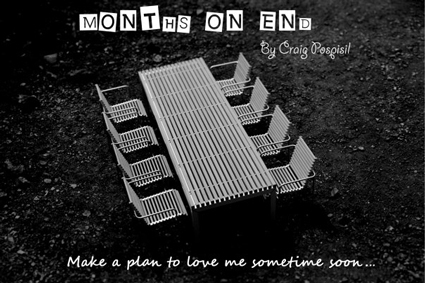 As suggested by the title, “Months on End,” the play follows a year in the life of its characters — relatives and friends — whose lives are all intertwined. It starts with a New Year’s Eve party in January, and introduces the characters a few at a time, month-by-month, as their stories unfold. We were given glimpses of relationships growing and of others falling apart, the anxieties of twentysomethings, and the ways our lives can change instantly. There are some laugh-out-loud moments, like a college graduation speech gone awry in a nearly “I Love Lucy” fashion, and a blow-out over a chipped Yellow Submarine collector’s item which results in the most hilarious tirade of the night but also proves poignant, as it marks a turning point in a marriage. There are also touching tear-up points, like rehearsing a young friend’s eulogy. And it’s the mix of comedy, tragedy and uncertainty that make the play transcend its barren stage and feel very real. The play’s reality and humanity also come from its good writing and strong performances. The cast is packed with theater majors, most of whom have MFAs, who inject a lot of personality and compassion into their characters. The music selection — songs to set the tone before each scene — was also a great mix. I would love to have the playlist. The play only has two more showings, this Friday, September 26, and Saturday, September 27, so do check it out if you’re looking for something to do this weekend. Just remember not to wear anything too warm — the audience sits so close, they’re under the same hot lights the actors are; and go to the bathroom before the hour-and-a-half performance — otherwise you’ll be trying to sneak across the stage to the door. When: Friday, September 16, 2008 at 8:00 p.m./Saturday, September 27, 2008 at 8:00 p.m. I think I was the shortstop… either me or Poff… probably Poff, actually. HAHAHAHAH! Rehearsing a friend’s eulogy is okay but what if he’s still alive? Now, that will be hilarious! Anyway, I just want to let everybody know that I’m a fan of indie everything- indie films, indie music, indie art.